The hotel is ideally located in Caleta de Fuste, close to the airport and well connected with the rest of the island, and on the eastern coast of Fuerteventura, an island that is especially renowned for its idyllic beaches. A striking and well-appointed hotel offering an array of amenities and a good choice facilities for both adults and children. The Elba Sara is situated in a picturesque beach front setting. Located directly on the beachfront with a golf course within touching distance. The hotel offers a lagoon style pool with separate childrens pool area, modern well equipped bedrooms and is perfectly suited to families. Caleta de Fuste, Fuerteventura - 4 Star. The Barceló Castillo Beach Resort resides on the sandy beach of Costa Caleta, famous for its stunning dunes and great windsurfing opportunities. Being arranged in a peaceful village setting, these bungalows prove to be ideal for families looking for a sun and fun holiday. 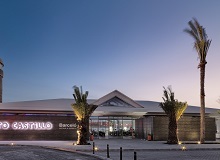 The Barceló Castillo Beach Resort hotel is located on the seafront of Caleta de Fuste beach. The Canary Island paradise strives to showcase the island’s unique qualities, its peace, tranquillity, and year round sunshine. The Barceló Fuerteventura Thalasso Spa is situated on the edge of the Caleta de Fuste beach. It has a large outdoor pool, great gym and luxurious spa area to enjoy during your stay. Caleta de Fuste, Fuerteventura - 3 Star. Sun and surf-loving families will appreciate this high quality complex. 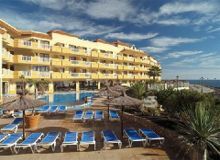 Overlooking the waterfront near to the hub of Costa Caleta, it`s a quick 500 metre stroll to the resort`s scenic quayside. The Elba Castillo complex offers something for all the family. A 3 star suite hotel, spacious and welcoming for family holidays, young people looking for an easy holiday or to practice sports on an island or couples wishing to explore the stunning island of Fuerteventura, declared a UNESCO Biosphere Reserve.